1. Fox Business Channel: Are Moon settlements feasible? Former NASA astronaut weighs in. With Stuart Varney: July 20, 2018 – 2:55 min – Apollo 17 astronaut Harrison Schmitt discusses the possibilities of permanent settlements on the moon and emphasizes the necessity of a strong, robust space program to counter similar Chinese plans. Click here to view or download the 14 Mb mp4 file (right click in player window and choose “save video as” to download the file). 2. Fox Business Channel: America back to the Moon: Apollo astronaut weighs in. With Stuart Varney: Dec. 12, 2017 – 3:30 min – Apollo 17 astronaut Harrison Schmitt on President Trump vowing Americans will return to the moon. Click here to view or download the 20 Mb mp4 file. 3. Fox Business Channel: Is Global Warming Real? With Stuart Varney. Topics: A discussion of temperature fluctuations; ocean contributions to CO2 increases vs. burning fossil fuels; and observational scientists vs. computer model makers. June 2, 2009, 3:51 min. To view or download a 20 Mb copy in mp4 H.264 with no commercials: [Click Here]. 4. Fox News Channel: Much Left to be Discovered on the Moon. With Rick Folbaum. 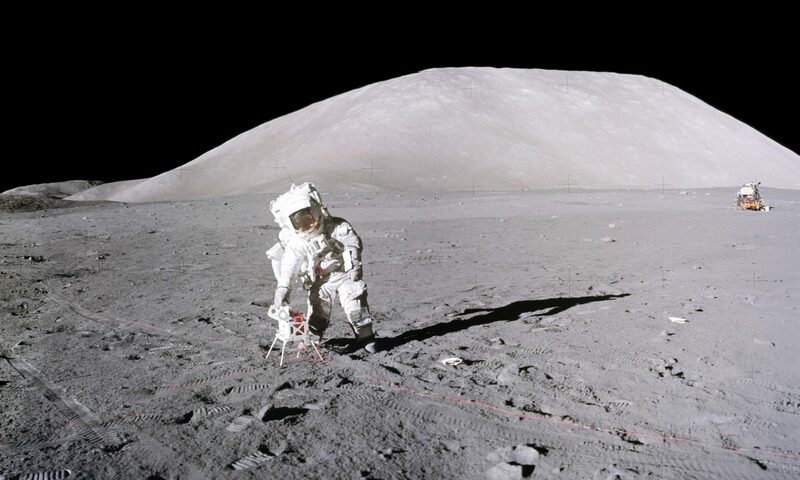 Topics: 40th Anniversary of Apollo 11; singing on the Moon; Moon vs. Mars; He-3 on the Moon; current Administration has no future space policy of note. July 17, 2009, 4:36 min. To view or download a 14 Mb copy in mp4 H.264 with no commercials: [Click Here]. 5. Fox News Channel: Former Astronaut wants New Space Agency. With Uma Pemmaraju. Topics: Reasons to dismantle NASA and to replace it with a National Space Exploration Administration (NSEA). May 28, 2011, 3:19 min. For online viewing at FNC (requires Flash plug-in): [Click Here]. To view or download an 11 Mb copy in mp4 H.264 with no commercials: [Click Here]. 6. Fox News Channel: What’s Next For NASA? With Uma Pemmaraju. Topics: A dead end course for American human spaceflight; dependence on Russia to get to the ISS; China’s aggressive moves to dominate space; the real definition of “commercial” space. July 16, 2011, 4:21 min. For online viewing at FNC (requires a Flash plug-in): [Click Here]. To download a 14 Mb copy in mp4 H.264 with no commercials: [Click Here]. 2. The Space Show: Climate Change Special Edition. With Dr. David Livingston, March 19, 2009, 16 Mb mp3 download file, (01:33:40): [Click Here]. Topics: Climate control (Nature vs. human); CO2 (sources and sinks); realists vs. modelers (observations of climate parameters vs. computer modeling capability); returning to the Moon (a very comprehensive discussion with caller questions). A similar comprehensive discussion is given in Climate and the Constitution available on the Downloads page. Later in the show, Dr. Schmitt talks about returning to the Moon rather than first going to Mars, He3 fusion as an alternative to fossil fuels, and maintaining the Constellation program (now canceled by the Obama Administration). A much more comprehensive discussion of the latter is given in Space Policy and the Constitution (with a Foreword by Dr. Michael Griffin, NASA Administrator (2005-2009)), also available on the Downloads page. 3. WGN Radio: Abandonment of the Moon Mission and Cancellation of Constellation. With Milt Rosenberg, April 19, 2010. 9.8 Mb mp3 download file, (00:42:04): [Click Here]. 4. Salem Radio Network: Cancellation of Constellation. With Janet Mefferd, May 6, 2010. 6.7 Mb mp3 download file, (00:18:42): [Click Here]. 5. America’s Radio News Network: Asteroid 2005YU55, use of Saturn V in the 60’s-70’s or modern heavy lift launch vehicles to deflect asteroids, and lunar resources. With Ernie Brown; Mid-Morning Edition, November 8, 2011. 1.9 Mb mp3 download file, (00:05:30): [Click Here]. 6. WGN Radio: Wall Street Journal Letter by 16 Scientists Disclaiming the Need for Global Warming Panic. With Mike McConnell, January 30, 2012. 4.5 Mb mp3 download file, (00:19:19): [Click Here]. Topic: Sixteen internationally known scientists led by Professor William Happer, a specialist in fusion physics at Princeton University, published a letter to the editor of the Wall Street Journal on Jan. 27, 2012, disclaiming the need for a panic that global warming is caused by humans (AGW). One of the signatories was Harrison H. Schmitt, who is interviewed here by Mike McConnell on the letter’s contents in a perceptive 20 minute discussion with caller queries at the end. [Click here for an online published copy of the letter], if you subscribe to the WSJ. Editing of downloadable files by Colin Mackellar, with thanks.